After collecting non-combat in-game pets for nearly seven years, Mists of Pandaria will finally give players the ability to collect, level, battle, and trade these monsters in their pockets. Who will be the very best like no one on Azeroth ever was? You can keep your pandas and your Monks; the most exciting feature of the Mists of Pandaria expansion for World of Warcraft is the new Monster Battle system, detailed today during the BlizzCon 2011 World of Warcraft preview panel. In a nutshell, once Mists of Pandaria goes live, most of the in-game pets you've collected over the years will transform from useless followers to fierce combatants, capable of fighting and gaining experience in player-versus-enemy and player-versus-player pet battles. These battles are turn-based, unlike any other battle in World of Warcraft. The player selects three of the six abilities each pet is able to learn and then deploys them to a battlefield, which looks much like the conceptual screenshot above. Along with the existing non-combat pets, Mists of Pandaria will introduce the concept of wild pets, pets that just appear as you are traveling. You might just be walking along and then BAM! A wild murloc appears! Some wild pets will only appear in certain zones, or at certain times, during certain types of weather; there could even be a pet that only appears in June at night when it's raining. Catching them all is just part of the adventure. As is traveling. As you, the trailer, journeys to new lands discovering new pets, recording them in your new Pet Journal (which also acts as an information resource of collectible pets), you'll encounter powerful NPC trainers that align themselves with a certain type of pet. Conquering them unlocks special trainer powers that can be used during battles. "It's not Pokémon" the PR people shout. Of course it isn't; that would be silly. Combining World of Warcraft and Pokémon is an insane idea that could only end in tears. 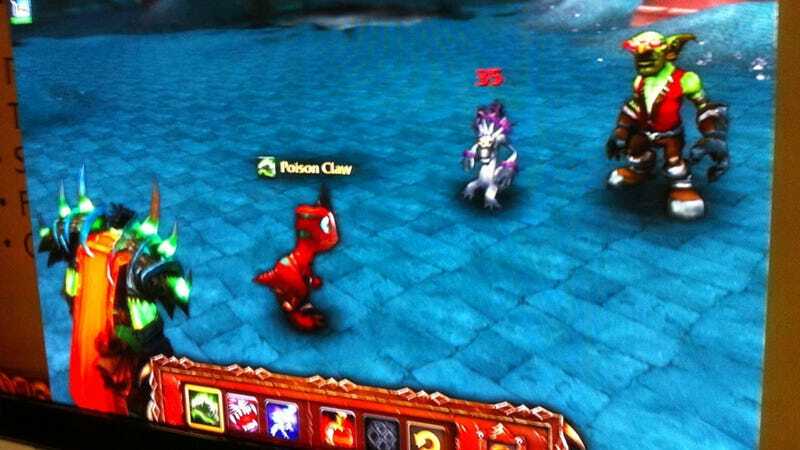 The new Pet Battle system will be in place when Mists of Pandaria launches.